© 2018 Anubha, B. This is an Open access article distributed under the terms of Creative Commons Attribution 4.0 International License. A classical pseudo lymphoma may be enunciated as Rosai Dorfman disease or Sinus Histiocytosis with Massive Lymphadenopathy[1,3]. Initially scripted by Drs Rosai and Dorfman in 1969, the Rosai Dorfman disease is an infrequent, localized or systemic, macrophage related disorder of obscure origin, which may incriminate the lymph nodes and adjunctive organs[2,3]. A frequent site of the mammoth, painless and bilateral, lymph node enlargement is the varying levels of cervical lymph nodes. Adjunctive peripheral or central sites such as the mediastinal, axillary, inguinal or retroperitoneal lymph nodes may be implicated, with the occurrence or absence of concomitant cervical enlargements[3,4]. Incrimination of the extra-nodal sites such as the bone, testis, orbit, eyelid, upper respiratory tract, salivary glands, skin with adnexa, pulmonary and renal lesions, central nervous system, peritoneum, thyroid, small intestine and joints may occur in an estimated one fourth (25 – 40%) or more instances. Aberrant immune system disorders may frequently depict extra-nodal lesions, thereby augmenting a poor outcome[4,5]. The first or second decades of life frequently delineate the condition, though no age is exempt, particularly with the extra-nodal category. The alternative nodular masses of the young or juveniles arising in the cervical region may require a distinction from the disorder. An estimated half (44.7%) the individuals may demonstrate a concomitant disease beyond a singular site[1,3]. The conditions global with a strong prevalence amongst the African community. Constitutional symptoms such as fever, leucocytosis, Elevated Erythrocyte Sedimentation Rate (ESR) and polyclonal hypergammaglobulinaemia may be elucidated[3,5]. 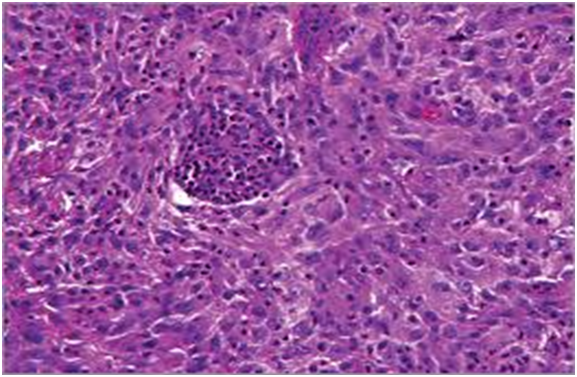 The matted lymph nodes with peri-nodal and capsular fibrosis may depict a cut surface ranging from gray to golden yellow, pertaining to the quantity of discernible adipose tissue. Capsular and peri-capsular inflammation with peri-nodal fibrosis may be frequent, though the intra-nodal fibrosis may be minimal or absent. The histopathology may demonstrate a fibrous, consolidated and inflamed lymph node capsule[3,6], a preponderant cellular distension of the lymphatic sinuses with a consequent, partial or total obliteration of the nodal architecture. The primary lymph node follicles arise predominantly within the cortical area. 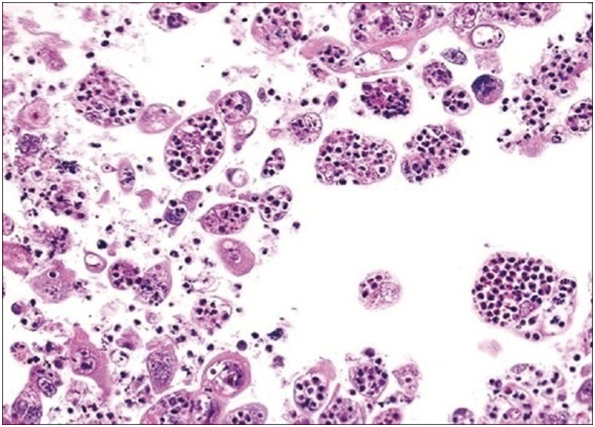 The lymph node sinuses may be engorged with multiple cells resembling histiocytes with vesicular nuclei, capacious, mildly eosinophilic, crystalline or pale cytoplasm with abundant neutral lipids. 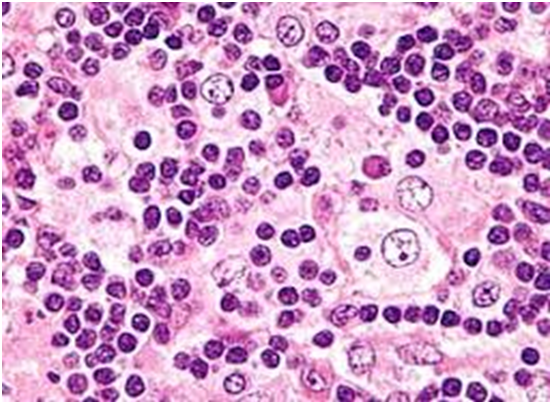 Histiocytes may engulf mature lymphocytes, plasma cells, Red Blood Cells (RBCs) and infrequently, neutrophils. The appearance of complete, intact lymphocytes within the histiocyticcytoplasm may be denominated as emperipolesis or lymphocyto-phagocytosis and is a characteristic of the disease confined to the lymph node[1,3]. The non – destructive internalization of the lymphocytes may be collateral to the cytoplasmic vacuoles[1,3]. Gradual impactions of the sinuses with unremarkable histiocytesand lymphocytesmay ensue. Clusters of histiocytes identical to those of emperipoles is may be expressed. Miniature micro abscesses or loci or necrosis may be situated within the distended sinuses. The nodal tissue betwixt the lymph node sinuses may demonstrate innumerable mature plasma cells, a few containing Russell bodies. The ultra-structural analysis delineates the sinusoidal histiocytes with extensive pseudopodia, an absence of Birbeck’s granules, viral particles or concomitant evidence of infection. Sinus histiocytes may contain intra- cytoplasmic adipose tissue globules. Immune histochemistry: A macrophage- histiocytic cell genealogy may be elicited with the immune phenotype. A contemporary recruitment of the circulating monocytes may be delineated. The mature plasma cells may manifest polyclonal immunoglobulin. A commingling of B & T lymphocytes may be enunciated. Immune reactivity for S100+, CD11C+ CD14+, CD33+, CD68+, CD163+ and non reactivity for CD1a- may be elucidated[3,6]. The aspiration cytology (FNAC) may exhibit a cellular augmentation with innumerable aggregates of enormous histiocytes composed of ample, light staining cytoplasm, an immersion of mature lymphocytes, neutrophils, plasma cells, plump histiocytes (emperipolesis) and occasional anomalous giant cells interspersed within the fibrinous tissue clusters. A backdrop of mature lymphocytes, plasma cells and in frequent neutrophils may be exemplified[7,8]. The ultrasound (USG) may exhibit distinct, bilateral, hypo- echoic; lymphoid zones situated within various cervical lymph node levels and may indicate a lymphoma. Figure 1: Rosai Dorfman disease at a sinonasal site. Figure 2: Rosai Dorfman disease with predominant nodal sinuses. Figure 3: Rosai Dorfman disease with sinusoidal dilatation and engorgement . Figure 4: Rosai Dorfman disease with preponderant histiocytes. 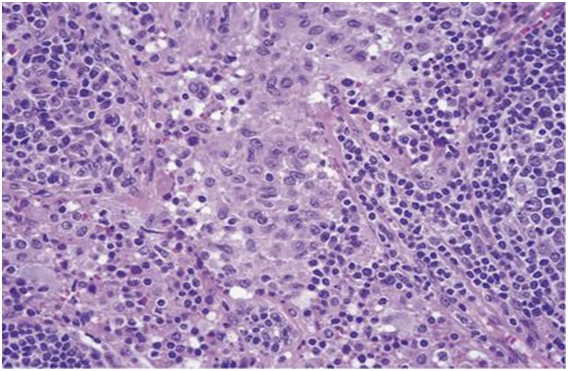 Figure 5: Rosai Dorfman disease with prominent langerhans cells. Figure 6: Rosai Dorfman disease with emperipolesis. 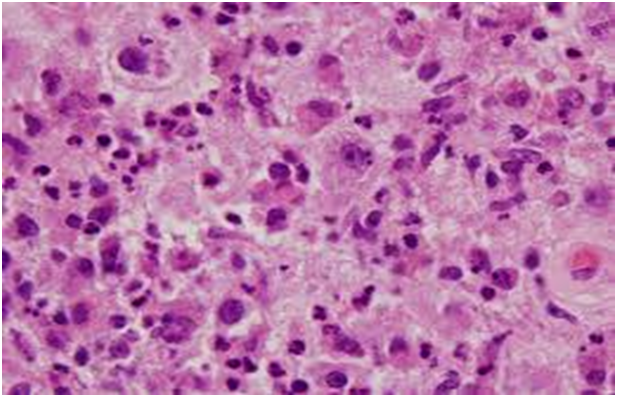 Figure 7: Rosai Dorfman disease – histiocytes with prominentnucleoli and abundant cytoplasm. Figure 8: Rosai Dorfman disease with prominent emperipolesis. Figure 9: Rosai Dorfman disease at a cutaneous site. 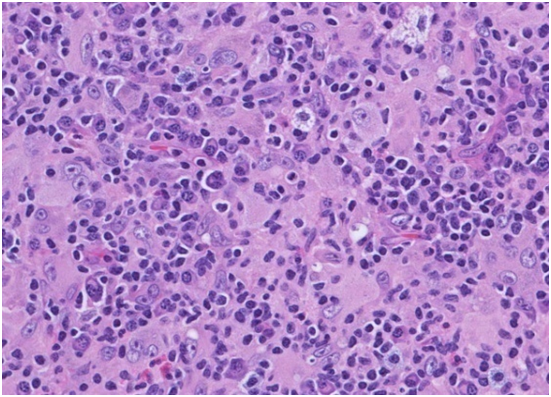 Figure 10: Rosai Dorfman disease with emperipolesis and lymphoid aggregates. 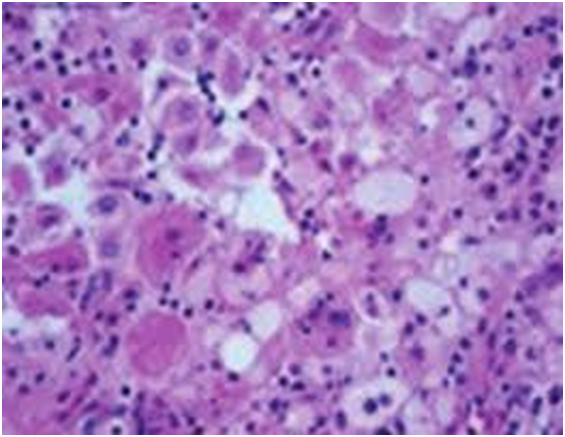 Figure 11: Rosai Dorfman disease with emperipolesis- aspiration cytology. Figure 12: Rosai Dorman disease with plump histiocytes and engulfed neutrophils. 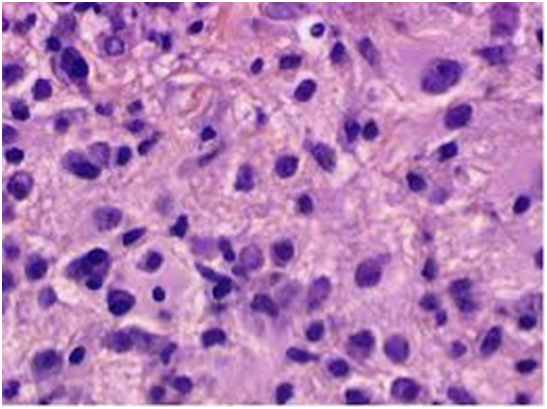 Figure 13: Rosai Dorfman disease with plump sinus histiocytes and emperipolesis. Rosai Dorfman disease is a well delineated, in frequent histiocytic proliferation of obscure origin with frequent spontaneous alleviation. 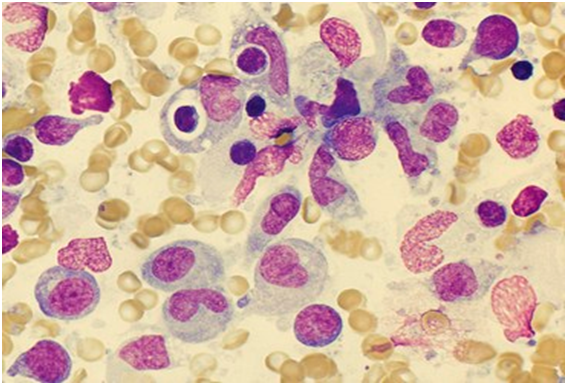 An Epstein Barr Viral (EBV) aetiology, a bone marrow stem cell and or a subtle, indeterminate immunologic modification may possibly engender the condition[8,9]. A gamma herpes virus (HHV8) may appear with the absence of Epstein Barr Virus (EBV) infection, though the implication of the co-existence is debatable. An asymptomatic, immense cervical lymph node enlargement with an extra- nodal emergence (25 - 40%), common in the Caucasians (43%) within the first or second decades of life (81%) and an estimated Male: Female preponderance of 2:1 may be enunciated. Lymph node enlargement is the most frequent elucidation. Enormous, bilateral, non-fixed, matted and non-tender lymph nodes with conspicuous peri-nodal fibrosis may are exemplified in a majority (90%) of the patients. The constitutional symptoms of low grade fever, normochromic normocytic anaemia, elevated Erythrocyte Sedimentation Rate (ESR), leucocytosis and polyclonalhypergammaglobulinaemia may be elicited[1,3]. Frequent extra-nodal sites may be the eyes and ocular adnexa, head and neck, upper respiratory tract, skin and subcutaneous tissue, skeletal system and the Central Nervous System (CNS). Adjunctive sites may be the Gastro-Intestinal Tract (GIT), pancreas, salivary glands, genitourinary tract, thyroid, mediastinum, breast, and the uterine cervix. Nodal and extra-nodal dissemination may be extensive[9,10]. The lungs, spleen and bone marrow may be particularly exempted from the disease. The extra-nodal sites may depict a histology simulating that of the lymph node, except that the fibrosis may be amplified and the emperipolesis may be reduced. Familial disorder with the cited concordance or Secondary to infection. A rising trend of the Epstein Barr Virus (EBV) and the measles virus antibody titres may be elucidated. 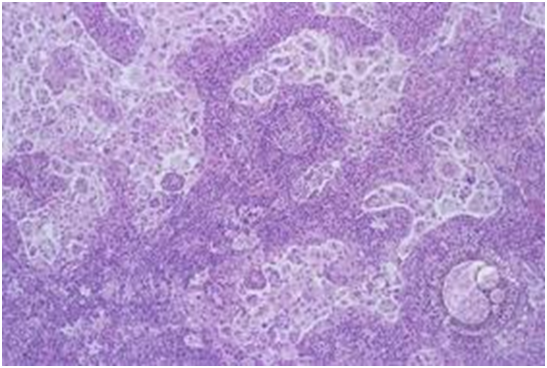 The Epstein barr virus may be detected by in situ DNA hybridization[3,4]. The gamma herpes viral (HHV 6) Deoxyribo Nucleic Acid (DNA) may be reactive with the serology and histology specimens and may contribute to the disorder. IgG4 related disorders may be contemplated with the appearance of Ig G+ reactive plasma cells and elevated serum IgG4 values. The IgG4 / Ig G ratio may be below < 40%. A current infection may be lacking. Activation of the monocyte / macrophage cellular fractions through the Macrophage Colony Stimulating Factor (M- CSF) may augment the macrophage dependent immune deprivation, in order to initiate the pathogenesis of the disease[2,3]. One third (33%) of the instances may depict a mutation in the MAPK / ERK pathway and the mutational profile may be concordant with the lymph node enlargement in the head and neck region, though it may be lacking with the disease outcome. Comprehensive and spontaneous recovery may ensue with a favourable prognosis. The clinical course may extend from a few months to years. Incidences of disease evolutions to malignant lymphoma and amyloidosis have been scripted. In aggravated disease, the compression of abutting structures may arise due to the enlarged cervical lymph nodes. Specifically the disease may resolve, in order to subsequently reappear at a concomitant site[9,10]. Contrasting Diagnosis: The disorder requires a distinction from reactive, non specific sinus hyperplasia (which is S100- negative with a lack of emperipolesis), Langerhans Cell Histiocytosis (LCH which may be reactive for S100+ and CD1a+ with BRAF V600 Emutation), the S100- non reactive Erdheim Chester disease with the BRAFV600E mutation, Hodgkin’s disease, metastatic carcinoma, leprosy, rhinosclerosis, metastatic malignant melanoma and lymphoma. Sinus histocytosis generated by cobalt, chromium or titanium insinuation within pelvic lymph nodes following hip replacement surgery may mimic the disease[1,2]. Non hodgkin’s lymphoma or auto immune lympho proliferative disorders may simulate the nodal adaptations of the condition[2,3]. Diseases such as Wegener’s granulomatosis, malignant midlinereticulosis, eosinophilic granuloma and fibro-inflammatory lesions may also simulate the derangement. The disease may be self limiting without any organ dysfunction or may be disabling and fatal. The uncommon, unpredictable disorder may tender a challenge in the selection of therapeutic modality and the optimal institution of treatment[2,3]. Approximately three fourths (70%) individuals may display a permanent affliction. Spontaneous clinical recovery may appear with the remaining (30%) patients. Symptomatic and confined nodal enlargements may be alleviated with comprehensives urgical resection or radiation. Asymptomatic instances may necessitate an observation of the individual[1,2]. Systemic and protracted conditions may be subjected to predominantly ineffectual therapies such as steroids, rituximab, cytotoxic chemotherapy with vinca alkaloids, anthracycline, alkylating agents and antimetabolites[11-13]. Activating KRAS mutation associated with the Rosai Dorfman disease may be targeted with therapeutic cobimetinib[14-16]. Bone lesions maybe primed with glucorticoids, chemotherapy with vinblastine, 6 mercaptopurine, vincristine, cladribine, clofarabine, chlorambucil and etoposide[17-19]. Administration of cladribine may be advantageous with the decline in the post therapeutic values of tumour necrosis factor α (TNF α) and interleukin 6 (IL6) from the elevated pre-therapeutic values, which may be concordant with the clinical outcomes. Recurrent and disseminated disease may be ameliorated with Siltuximab, an Anti -Interleukin 6 (IL6) chimeric monoclonal antibody with an anti angiogenic influence in order to curtail the inflammation and acute phase reactants. Siltuximab is a contemporary molecule for addressing the virally (HIV+ and HHV8-) induced multi-centric castelman’s disease. It acts through the adhesion and prohibition of interleukin 6(IL6), a pro inflammatory cytokine molecule which activates the acute phase reactant proteins, neutrophils and the evolution of B cells .The molecule may engender the discrimination, continuation and angiogenesis of the malignant cells Siltuximab is known to produce a skin rash and Upper Respiratory Infection (URI), following administration. The non specific therapeutic regimen may incorporate a low dose interferon therapy, antibiotic therapy, radiation with partial or total surgical resection of the nodular masses, as mandated. A complication on account of the immunologic anomalies such as amyloidos is or a widespread disease involving vital structures may engender the mortality on account of the disorder. 1. Rituparna, S. A rare case report “Rosai Dorfman disease” (2017) IOSR 16(11): 95-98. 2. Lee, H., King, G., Garg, K., et al. 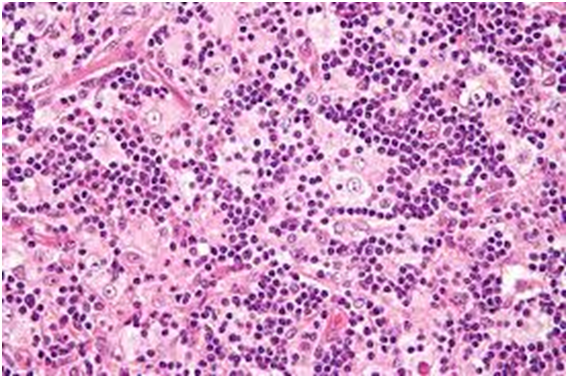 Successful treatment of disseminated Rosai Dorfman disease with Siltuximab. (2018) Haematologica 103(7): 325-328. 3. Rosai and Ackerman’s Surgical Pathology. Tenth Edition 1801. 4. Rosai, J., Dorfman, R.F. 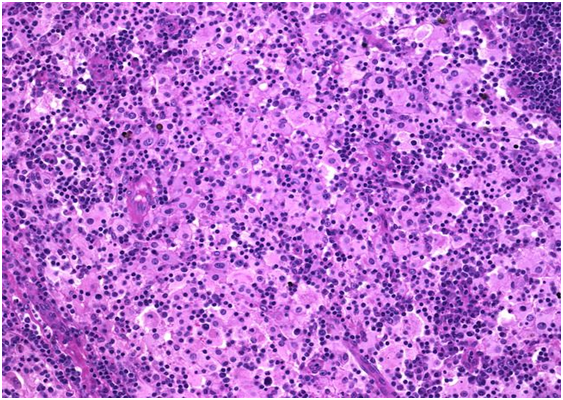 Sinus histiocytosis with massive lymphadenopathy: a newly recognized benign clinico-pathologic entity. (1969) Arch Pathol 87(1): 63-70. 5. Rosai, J., Dorfman, R.F. A pseudo-lymphomatous benign disorder: analysis of 34 cases. (1972) cancer 30(5): 1174-1188. 6. Mosheimer, B.A., Oppl, B., Zandieh, S., et al. Bone involvement in Rosai Dorfman disease: a case report and systematic literature review. (2017) Curr Rheumatol Rep 19(5): 29. 7. 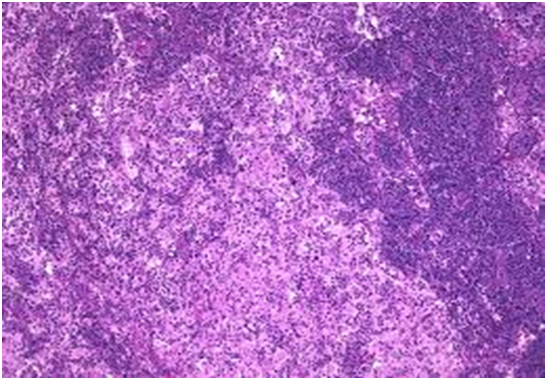 Kumar, B., Karki, S., Paudyal, P. Diagnosis of Sinus histiocytosis with massive lymphadenopathy (rosai dorfman disease) by fine needle aspiration cytology. (2008) Diagn Cytopathol 36(10): 691-695. 8. Deshpande, A.H., Nayak, S., Munshi, M.M. Cytology of Sinus histiocytosis with massive lymphadenopathy (Rosai dorfman disease. (2000) Diagn Cytopathol 22(3): 181-185. 9. Sennes, L., Koishi, H., Cahali, R., et al. Rosai Dorfman disease with extra nodal manifestation in the head. (2004) Ear Nose Throat J 83(12): 844-847. 10. Bist, S.S., Bisht, M., Varshney, S., et al. Rosai Dorfman syndrome with extra nodal manifestation. (2007) J Assoc Physicians India 55: 445-447. 11. Aouba, A., Terrier, B., Vasiliu, V., et al. Dramatic clinical efficacy of cladribine in rosai dorfman disease and evolution of the cytokine profile towards new therapeutic approach. (2006) Haematologica 91(12): 52. 12. Ortonne, N., Fillet, A.M., Kosuge, H., et al. Cutaneous Destombes Rosai Dorfman disease absence of detection of HHV6 and HHV8 in skin. (2002) J Cutan Pathol 29(2): 113-118. 13. Liu, P., Wang, P., Du, J., et al. Successful treatment of refractory cutaneous Rosai Dorfman disease with vincristine. (2015) J Dermatol 42(1): 97-98. 14. Paryani, N.N., Daugherty, L.C., O’Connor, M.I., et al. Extra-nodal Rosai Dorfman disease of the bone treated with surgery and radiotherapy. (2014) RareTumours 6(4): 5531. 15. Garces, S., Medeiros, L.J., Patel, K.P., et al. Mutually exclusive recurrent KRAS and MAP2 K1 mutations in Rosai Dorfman’s disease. (2017) Mod Pathol 30(10): 1367-1377. 16. Jacobsen, E., Shanmugam, V., Jagannathan, J., et al. Rosai Dorfman disease with Activating KRAS Mutation – Responseto Cobimetinib. (2017) N Engl J Med 377(24): 2398-2399. 17. Saboo, S.S., Jagannathan, J.P., Krajewski, K.M., et al. Symptomatic extra-nodal Rosai Dorfman disease treated with steroids, surgery. (2011) J Clin Oncol 29(31): 772-775. 18. Nasseri, E., Belisle, A., Funaro, D. Rosai Dorfman disease treated with methotrexate and low dose prednisone: case report and review of literature. (2012) J Cutan Med Surg 16(4): 281-285. 19. Goyal, G., Ravindran, A., Patnaik, M.M., et al. Clinical features and treatment approaches in patients with Rosai Dorfman disease: The Mayo clinic experience. (2017) Blood 130(1): 3573. 20. Van Rhee, F., Wong, R.S., Munshi, N., et al. Siltuximab for multi-centric castleman’s disease: arandomized, double blind, placebo controlled trial. (2014) Lancet Oncology 15(9): 966-974. 21. Image 1 Courtesy: Jaypee Journals. 23. Image3 Courtesy: ASH Image bank. 31. Image 11 Courtesy: Basic Medical Key. 32. Image 12 Courtesy: Dermatology advisor. 33. Image 13 Courtesy: Cyto-journal.